I worked on a few more note cards for HorseSpirit Arts Gallery this week. Supplies: Stamps – Simon Says Stamp, Stampin’ Up!, paper – Doodlebug Designs Boos & Brews, Neenah Classic Crest Solar White, Stampin’ Up! Basic Black, Old Olive, Taylored Expressions Build A Scene, ink – VersaFine Onyx Black, dies – Spellbinders (circles), Stampin’ Up! (foliage), Taylored Expressions (banner), embossing powder – Filigree Fine Art Powder clear, organdy ribbon – Offray. Categories: card, caring, encouragement, note, thinking of you | Tags: card, Doodlebug Design Inc, Neenah, Offray, Simon Says Stamp, Spellbinders, Stampin' Up!, Taylored Expressions, Tsukineko, VersaFine | Permalink. Very nice! 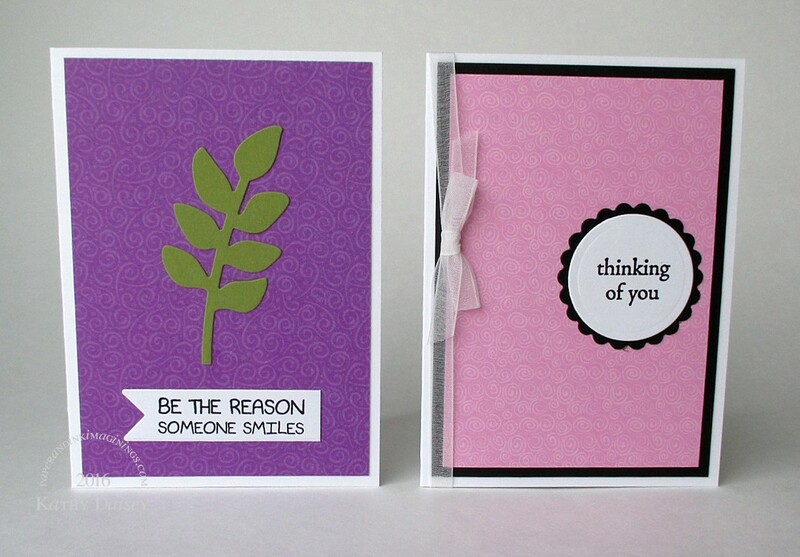 The sentiment on the first one is really different, and of course, the black and pink combination looks super. Thanks so much, Gillian! I needed a pink & black fix!